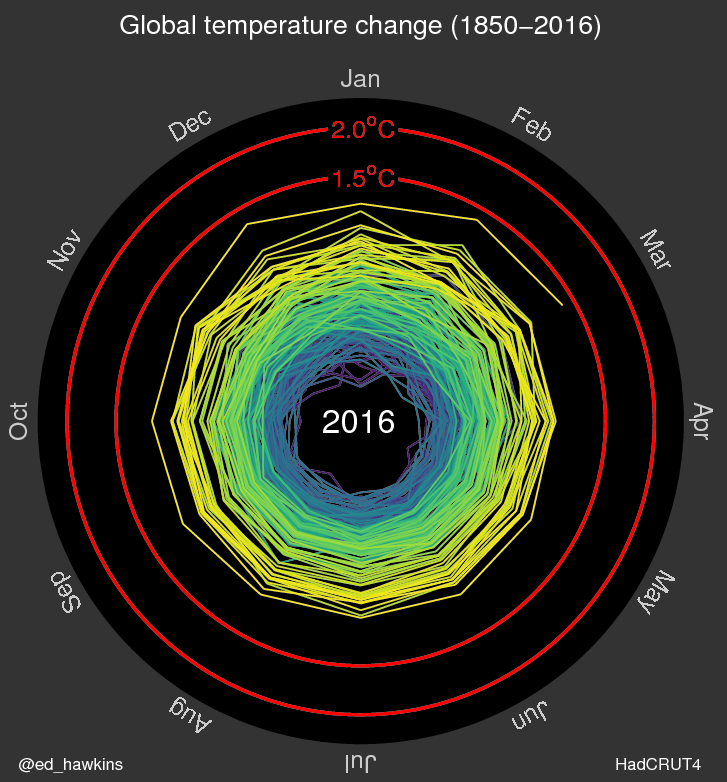 Spiralling global temperatures. Click for full size animated version. The animated spiral presents global temperature change in a visually appealing and straightforward way. The pace of change is immediately obvious, especially over the past few decades. The relationship between current global temperatures and the internationally discussed target limits are also clear without much complex interpretation needed. 3. Are temperatures ‘spiralling out of control’? No. Humans are largely responsible for past warming so we have control over what happens next. 4. What do the colours mean? The colours represent time. Purple for early years, through blue, green to yellow for most recent years. The colour scale used is called ‘viridis’ and the graphics were made in MATLAB. I’m a physics major at BYU and I stumbled across a website that had posted this data and I had some questions about your data analysis. First off, how did you collect data from 1850-1900 and did you, in your opinion, collect enough to have sufficient data points? My second question is what made you decide to measure the relative temperature of the earth to what it was in 1850-1900? As a fellow scientist, I want to understand your methods to better solidify my own understanding of how to analyze data. Thank you for your time. There is not the least of ambiguity here on the source of the data. It is described as HadCRUT4.4, and you can read up the full documentation of how this is generated at http://www.metoffice.gov.uk/hadobs/hadcrut4/. Evidently, you want to plot positive numbers on this diagram, and we have increasing temperatures. Hence, one really had to choose the baseline at the beginning of the plotted interval for this figure. Most line and bar graphs representing global temperatures are plotted above and below a mean of relatively recent temperatures – “last 30 years”, or “since 1980”, for example. Comparing to these means, it seems to me, give a doubly-false impression. First, the means have been badly skewed – raised – by global warming. Second, there is no normal any more. This representation avoids those problems. A lot of work goes into understanding the uncertainties in the estimates, which is, I guess, what your question is getting at. As an astrophysicist myself I can tell you that all respectable Universities across the globe have large archive libraries, in which very meticulous weather observations are kept on a daily basis from the 19th century. where I work in particular, our archives go back to the 1770s. As for the 2nd question, my immediate guess is that the author (like most studies actually) sought to use as reference a period where the consequences of man-produced greenhouse gases hadn’t had an impact yet on the climate yet. Obviously some regions (e.g. the UK) where literally black from coal burning in the 1850s already, but that was really localized compared to the whole reservoir that is the atmosphere. Okay, but how do you ensure your datapoints e.g. for water masses and non-inhabited land masses are there? I think I can answer that one, although I am NOT a climate scientist. I think you’ll find the data for the sea-surface temperature (SST) dataset comes from ships logs. The British Royal Navy has been criss-crossing the globe since the 1600’s. They were in competition with other navies doing the same thing (especially the French, the Spanish and the Portuguese). Every four-hourly? daily? captain’s log for every ship starts with the same information including the lat/long, date/time, weather, wind speed/direction, cloud cover, sea temperature etc. I expect the US Navy would record the same information since the 1770’s too. Datasets from ship logs are completely unreliable as the methods they employ for taking temperature readings are extremely poor. Dipping a bucket in the water followed by hoisting it up to take a reading can shift the temperature by several degrees and depending on how conductive the material of the bucket is made out of, along with a dozen other corrupting factors, further corrupts the data. Not true – the sea surface temperature observations are corrected for the effects you describe – read the papers discussing the construction of the datasets. Also, if we used the raw data then the global temperature change is larger – the corrected data (as used here) has lowered the trend. Bryce, I’m not a physicist, but like you I’m also wondering how data from that far ago was collected as well. I also would like to know what records were kept at that time period that actually collected ‘global temperatures’. I’d love to see a reply to this as well! I don’t believe the data during that perid was actually collected by the author 🙂 Sorry, I couldn’t resist. Considering temperature data collection between 1850 and 1900, envision an older man wearing a bathrobe and bifocals, in blowing snow, in South Dakota, in February. The measurements are taken using a thermometer sent form Washington D.C. by horse drawn carriage and steam locomotive. Given this, representing temperature measures with one tenth of a degree precision from this time period is frankly absurd, although that doesn’t seem to slow anyone down. Robert – remember that we have thousands of temperature measurements spread across large areas so the precision of each individual measurement is not as important. Ed. After telegraphs became available, field reports were sent by telegraph. Hoisting a bucket of water takes mere seconds. The adjustment for hoisting is small. Experiments were carried out in the 1880’s to compare temperatures measured by hoisting versus a thermometer directly in the water. You’ve done the conversion from Celsius to Farenheit incorrectly. The *change* in temperature we’re discussing is 2C which is equivalent to a *change* of 3.6F, not 35.6F. I think that should fit better with your experiences. Interesting – but I have used this diagram for months already. Thanks for your info and infographic. I cannot get the animated gif to work. 404 — File not found. Thanks – our servers are struggling with all the interest in the figure. Have updated the link to a different version. Hello. Cool graphic. I wanted to ask what exactly is being plotted. My understanding is that each point is (given month’s given year’s temp minus same month’s 1850-to-1900 average temp). Is this correct? If so, there could also be a “zero degrees of temp change” circle somewhere toward the center of this graphic? The blue and green early year lines would then zig zag across that zero circle, while more recent time periods’ lines (yellow) spiral further out from the zero circle. But the bull’s eye of the graphic doesn’t represent zero degrees of temp deviation because of the possibility that a given month’s temp could be lower than its historic average. Could you please confirm that I am understanding this correctly? Or explain where I’ve gone wrong? Apologies if I overlooked an explanation you already posted. Thanks. The first frame of the animation shows the zero degree circle, which the early lines do cross (although the line is not shown in the other frames). I have used the annual average between 1850-1900 as the baseline as that is what the IPCC AR5 chose, and because the data is less comprehensive in the early period. Since you said yourself, (I have used the annual average between 1850-1900 as the baseline as that is what the IPCC AR5 chose, and because the data is less comprehensive in the early period. How can we be sure enough equatorial measures were made when it is known some of the harshest conditions and least evolved indigenous cultures resided in the tropical climate area, making for less communication of the higher numbers added to the global climate average during the earlier times? Are the non-included areas all warmer areas that would tip the average up and make this whole thing look more like a tight spiral rainbow? with little peaks instead of what is portrayed? Thank You, I hope these questions are fair and not considered biased I want to believe but I need more information to be sure. The way that the global datasets are constructed accounts for the different temperatures over the planet. This is done using ‘anomalies’ everywhere rather than the absolute temperatures. Could you make a series of similar charts showing CO2, CH4, etc with known values over time in a similar spiral graph? Then perhaps overlay a chart with the spiraling gases onto of the temps such that visual correlations can be easily seen? It looks like the year 1850 is taken as plus/minus 0 degrees. Great gif! I can’t wait to show it to my students at school (secondary school teacher in London). Could you do graphs that show temperature changes caused by each of the greenhouse gasses, the Sun, the Milankovitch cycle, and the other causes of warming? That would really seal the deal. I like this idea. There is a nice interactive website here showing simulations with different forcings (http://www.bloomberg.com/graphics/2015-whats-warming-the-world/) but some similar spiral versions would be fun to make too. This is a wonderful info-graphic. I would be exceptionally interested in seeing additional historical years of data displayed. I understand that there will be a slight decrease in the reliability of the data the farther back you go but I believe the temperature estimates that have been used to build the climate models are quite accurate and it would be a fairly straight forward effort to display that data visually. It would be great to see 300,000 (or more) years of data plotted in this manner rather than being limited to only the past 66 years. Thanks again for all your hard work providing such an excellent visualization that can be easily consumed. I’d also like to see individual spiral graphs that interpret other contributing data from the same historical period to see the effect of additional factors individually and then superimposed over one another, to expand upon the new view as a key to data accessibility and understanding from the masses. Upon an initial view, I had a personal predisposition to look more closely at the the era of industrial revolution, watching for that fossil fuel CO2 spike in usage and the possible global effect. My background is more in history and literature, so I was looking to draw a correlation between what I had been taught previously and how this new data might revolutionize that outlook. I wonder what graphs of other measured social and environmental variables, put into the same interpretive software might add to our understanding. Global human population estimates, global species extinction rates, internal known solar system events, evidence of possible external system events, etc.,; whatever elements the brightest minds can think to add to measuring the elements that help to create the stew of life as portrayed in similar individual graphs for their own individual unique development and then overlay end to see how they may have contributed to the whole. Sorry, I don’t see a way to edit. There is an outlier in the late 1800’s, do you have any insight? Also, after reading the site more closely, a graph on the growth of domesticated crops versus the loss of natural environmental zones/foliage would be interesting, I would think. Thanks. This illustration would be ideal for use in lectures that I give on cruise and expedition ships in the Arctic. It always amazes me that some people are still convinced that climate change is a myth. I have just finished writing a book on the Atlantic Arctic, which looks at the Inuit of Eastern Canada and Greenland and the Sami of Arctic Norway. It covers both their histories and the effects of climate change on their cultures. Currently I am trying to source illustrations for this work (which is for educational purposes). Is it possible that I could use this wonderful illustration as a final page? (or maybe even on the back cover?) It would also be very useful when giving lectures in both University colleges and schools where I guest lecture. Hi Eric – of course, feel free to use it! How does one capture only the GIF for use on a web page? It’s an extremely impressive piece of graphing. I think it’s going to have a lot of impact. The image above was originally linked to the full GIF, but our webservers were struggling to cope. There are other copies of the GIF available, e.g. here. Hi Ed. This is a beautiful graphic and I fully support the scientific consensus behind what it shows. I have a minor concern over how it could possibly be slightly misleading, however. The way I interpret the plot, the area within the spiral corresponds to some measure of the magnitude of the year-round average temperature. If the temperature is scaled linearly along the radius of the plot, wouldn’t the interior area then grow with the square of the temperature, which might be misleading? Hi Jack – interesting point which a few others have made as well. I think different people will interpret the figure in different ways. If you are watching how close the spiral gets to the 1.5C line then I think a linear scale makes most sense. Others may see it differently. When I have some time, I will remake the figure with a square root scaled radial axis to see how much difference it makes! I agree with your point on the linear scale . Polar plots always set off warning bells in my head when circular area has any kind of significance to the interpretation of the plot, though. Would love to see what the square root scaled radial axis plot looks like. That would give a specific significance to the zero value when that value is quite arbitrary. You could use absolute values in which case the difference between a linear and square-root plot would be rather small. Hi, this is very interesting. Could you please plot two more animations – one with the data plus one standard deviation, and one with the data minus one standard deviation? I should clarify that I meant the variance output by the algorithm that estimates the global mean, not the variance of the input data. What a powerful visualization. I would love to understand what tools you used to create it. Could you please comment? Good question – I made each frame in MATLAB and then combined into a large GIF. The colours of the lines are from the ‘viridis’ colour scale which is colour-blind friendly and perceptually uniform. Very cool! Thanks a bunch. Thanks for being colour-blind friendly. Graph reading can be really difficult for us tritanopes. Good visual. I imagine it though in 3-D. The 2-D information would stay the same but let it rise in the z axis with time. It woudl look like a tornado. Because man’s contribution to atmospheric carbon dioxide was so low in the 1800s (really pre-WWII), this chart is significant evidence that other factors than just man-made CO2 are in play. Of course – many factors have always been known to be important. Volcanoes, aerosols, solar activity, land-use change etc all play a role, as well as other greenhouse gases, but CO2 is the dominant factor. So, there is a temperature increase. It is largely man made, this time, what about previous times? What happened previous times? Did people go to the moon or Mars and build vast cities, were people happier? And, when did species go extinct at a pace unmatched by hunting due to warming? Were there floods and droughts displacing legions of people in the data (because that is in the news)? On much longer timescales, changes in Earth’s orbit are the main culprit for climatic changes, e.g. the semi-regular ice ages over the past ~million years. Variations in volcanic eruption frequency and solar output are also sometimes important. OK, interesting. But my point is that in reality, chemical weapons are being used in Syria. In reality, people in China have chest pains and die from air pollution. It is a nice graphic. Millions of people are living in the poorest of conditions in refugee camps while cities like Doha are growing to become new pollution hubs. Ultra fine dust is entering the bloodstream of millions in Europe. Poland is like a burning open coal mine. The whole food chain is pervaded by aerial and ground water pollution and by profit driven junk food production. Is that why GISS starts in 1880, 1878 had inconvenient data. Looks like Ed accidentally let a little cat out of the bag, how can 1878 March be as hot as 1989 March with global warming? El nino as a naturally occurring cycle must be dismissed. Hi, great graphic, but I miss the legend for the colors used. Violet in the Center -> blue -> green -> yellow. What does that exactly mean? The colours represent time with purple being early years, through blue, green to yellow being the most recent years. At least we have a new entry for https://en.wikipedia.org/wiki/Misleading_graph ? I believe it was Tufte who said that if you see circles on a chart, be immediately suspicious of biased presentation? To be specific, such a graph as above INHERENTLY visually emphasizes later temperature increases which seem to be actually measured by their radius from the center (this is also misleading, mentioned later), yet appear visually either as circumference or area which increase by the 2(pi)r or (pi)r^2 respectively. (Setting aside the inherent inability of the graph to show any value less than positive.) The zero-value ‘circle’ is undesignated, so even a no-change result *appears* to be an increase as it’s likely perceived by the viewer to be ‘distance from center point’ not ‘distance from arbitrary circle around the center date’. Finally, the presentation more or less deliberately hides zero or small values in the “mess” while extreme increases are highlighted by the dark space around them, (deliberately?) taking advantage of probably the Müller-Lyer, Jastrow, or Hering illusion effects, not sure which. It’s a pretty animation, but egregiously misleading. Which is great if you’re preaching to the choir, I guess. Steve, is your snarky dismissal of Ed’s graph derived from a purely academic rejection of the messenger’s tools or do you genuinely dismiss the mountains of data confirming the message: The earth is getting warmer? I am curious how you dismiss the dozens of unadorned line graphs whose interpretation cannot be argued by any rational person (see link). And please don’t use the natural variability argument. The attached article clearly shows that human impact far exceeds anything natural. While Steve’s comment is perhaps not nicely worded it has validity. Consider: Take the negative value of all the anomalies and create the same animation. Would it leave the viewer with the same impression? I’d say no, so the presentation is biased. That is sad since Ed Hawkins is a proponent of avoiding biases in scientific presentations (see: “ending the rainbow”). Possible solution 1: Animation of two side by side circles. One for Negative, one for Positive anomaly. Possible solution 2: A circle plot with months from 0 to 180 degrees for positive values, and 180 to 360 for negative values (e.g. Jan would 0 to 15 degrees for positive, or 180 to 195 for negative). Radius would still represent change in anomaly. This is an interesting method for presenting the global time series. I especially like how you get to focus on the evolution of the time series one year at a time. Not to pile unto the many suggestions you have already received, but it would be interesting if you varied the line width each year to reflect uncertainty in the data set. It would also be poignant to post an overlay of other atmospheric deposition products. The last 30 years have been measured. Magnesium, Sulfur, Sodium, Chlorine, Potassium, Nitrogen. Together they represent a comprehensive view of human impacts on the troposphere. Exactly. Why are climate scientists not talking publicly about the geoengineering programs going on? Do we? We have control over how much greenhouse gases we emit from now on, but there’s a lot already in the atmosphere and I don’t think we have a way of removing them other than waiting decades. Is there a way of cleaning up the mess previous generations have made? An information design issue: is it possible that the combination of spiral graph format and color coding subtly underplays the significance of the change by inducing a visual reading of linear perspective on the presented data form? Thank you for the great visualization of the global temperature change data!! Another interesting approach could be to place time scale on the third dimension, thereby creating an interactive 3-D graph. The end result will then appear like ‘the vortex of a tornado’ and will highlight the monthly gradient of temperature change over 1850-2016. Ed, this is highly informative and easy to understand. I would like to use a similar animation for my MPH Capstone project. What program or interface did you use to make this? Nevermind, I did not look hard enough at the information at the beginning of the presentation– MATLAB. Thanks! I think this is a nice graphic Ed and I think the data used is appropriate. However, the conflict I have for most scientists attempting to “prove” global warming is time scale. There is no dispute that our planet has been through cataclysms and dramatic climate changes in its history of ~4.5 billion years. Taking a sample of ~130 years and trying to draw conclusions about the dynamics of ~4.5 billion years is misleading and has led us to this political quagmire we are in today. Yes, lets clean this place up and start being more responsible about how we use our resources. “Fossil” fuels are antiquated technology and should be phased out, but their impact on GW is disputed. Where is the public discussion about the geoengineering programs going on all across this planet? I have made no conclusions about the dynamics of 4.5billion years from the past 166 years. Most of the large variations in climate since Earth formed have been due to changes in the Earth’s orbit, which slowly varies its shape over many 10s of thousands of years – it has not changed over the past few hundred years so cannot be the cause of the observed increase. Changes in solar activity and volcanic eruptions cannot explain it either, but the changes in human activity (greenhouse gases, sulphate aerosols etc) can and, more importantly, we understand the physics of why. What geoengineering programs do you refer to? In the report you refer to: “The forcing from stratospheric volcanic aerosols can have a large impact on the climate for some years after volcanic eruptions”. The chart they use to explain this information includes volcanic eruptions as a natural cause of climate change, but limits that variable only to changes in solar radiance. The data ignores all emitted compounds from the natural phenomena and only includes them as part of the anthroprogenic phenomena. Am I interpreting this incorrectly? It sure seems misleading. Thanks. Unless you are far more specific about your concerns, your comments are going to be deleted. It is a very large report…. In Fig. SPM5, the natural solar irradiance bar refers to long-term changes in the sun’s energy output – it has overall increased slightly since 1750. Volcanoes are not included on that particular chart because they are episodic and so have not provided a long-term CHANGE in radiative forcing – of course, they cool the climate for a year or two after they erupt. Emissions of CO2 etc from volcanoes are considered part of the natural and continuous flux and exchange of gases within the whole climate system which have been occurring without human activity. I am truly trying to wrap my head around all of this and I appreciate sincere dialogue. I don’t want to be dismissed because I don’t agree with you; however, it is your site. My interest is in the truth and that is my agenda. Thanks. I understand that volcanic eruptions would not have a long term effect on radiative forcing; however, their emissions would seemingly have a dramatic effect. What still causes me pause is that natural emissions and anthroprogenic emissions would be extremely difficult to differentiate when our system of interest is the entire globe. In the report you refer to, I find nothing that quantitatively differentiates natural emissions from anthroprogenic emissions. How and where has the baseline for natural climate system emissions (and exchange) been determined? Here we go with the chemtrails conspiracy theories…. Is it possible to ad a time-slider, so the user can stop the animation and return to a specific moment in time? Or to slow down the animation? It would be interesting to play a little with the data. For me the animation is a little to fast. Will see if I can do that for v2! That’s the best one I’ve seen Clive, thanks for that. Ed, This is a brilliant way to present the temperature information visually. I assume you will be updating this each month. I’ll be checking back and sharing with whoever will listen. Excellent work. Thank you! It is interesting to see the temperature development, starting in 1850. That was right after the Little Ice Age. What about starting in 1650, or earlier? The thing that always confuses me about the folks who work to deny statistical representations of climate change is this. Are these people saying that our present day economic model is sustainable? Are they saying that pollution doesn’t endanger health? Can’t we agree that polluting air & water is a bad thing? Even if, as they claim, there are problems in the data (and it appears to me from reading the comments that the creator of the chart had adjusted for these problems) I would say that clean air and water are necessary and desirable in of themselves. I don’t know anybody that doesn’t want clean air and water. What does pollution have to do with global warming? CO2 was only recently LEGALLY made a pollutant by the EPA in 2009. Despite being a necessary element for 99.9% of known life on this planet to exist, the EPA decided to classify it as a pollutant. If you have the will, think about that for a few minutes. Pollution is an entirely separate issue from climate change. The world, the environment, everything from economics to law has a “natural balance”. The climate also has its own natural balance. I’m sure that you would agree with me if I said that producing an excessive amount of CO2 would not be good for the environment? That it could even be detrimental to such environment? Considering what we KNOW about the effects CO2 has on this environment, that producing CO2 on current levels would seem to be an imbalance on “natural levels?” That it could even be causing this “global warming” phenomena? Hope I have written this in a language that you understand. Since it doesn’t seem like you understood the scientific evidence that’s been produced by many reliable sources from all around the world. I honestly find it quite comical and puzzling how “Global Warming” is still up for debate. Maybe we can get back to the argument of the world being flat? I mean, since when I look out at the horizon, it seems to end!? I’m sorry, maybe that’s taking a bit too far. I honestly do not believe that somebody can be that stupid? Or is it just ignorance? I’d say that in Abotts’s case, there may have been a hidden agenda. I am curious to know what your opinion is on the issue of climate change and global warming? Oops I meant to say, “climate change.” What is your opinion on the levels of CO2 and its effects on the environment? Do you not see the relationship between CO2 and global warming? Have you not seen the levels of CO2 in our atmosphere and our global temperatures? You tell us to think for a minute. But have you actually read up on what you’re trying to argue? Ignorance is bliss, but ignorance won’t be an excuse and it certainly won’t help you if we keep going at current trends!! I don’t know what will happen exactly, but going by how frequently our extreme weather days are occurring, I doubt it’s gonna be a good outcome. Going by your argument, then it should be ok if we have 10% CO2 in atmosphere? How about 50%? Hell why not make it 100% CO2?? I mean, CO2 is part of our atmosphere right? And it’s only recently been put on the list as a pollutant?!?! So what the heck. That’ll be fine. Dear me!!! I just can’t understand the logic of people sometimes. Seriously. Let’s TRY take care of the place we call home. Please. We have made very similar figure using the RCM scenario outputs and published Climate Dynamics. I’ve already twitted to you possibly you missed. check the Figure 5 in link below. Can’t we agree that polluting air & water is a bad thing? Even if, as they claim, there are problems in the data (and it appears to me from reading the comments that the creator of the chart had adjusted for these problems) I would say that clean air and water are necessary and desirable in of themselves. It’s been a few months since your spiral graph came out. I’ve been very curious to see how the ceaseing of El Niño would impact these recent months. Will you be updating the animation? If so, how often? Thanks for your work. but have yet to put that version on the blog – I will do soon though. Could you please update it to include the last few months (I read that July was yet again the hottest month on record, something I wish I hadn’t heard so many times recently), as we are still setting records, and it could stress the continued expansion of the circle? Might it not be useful to look at the same dataset, with the timeframe inverted — so the the most recent year is at the origin, and the earliest years outward? If the argument is that the format is artificially expanding the outermost circles, shouldn’t the inverted set look very similar? This site might be far too advanced to deal with my question; but I will ask it anyway. Deniers of climate change are often heard finding fault with the position of a particular baseline in a climate graph. The point of contention appears to be that the baseline is never properly set ‘where it should be’. Sometimes they insist it should be set at 0; if it is, then it should be set at a value that to me seems completely arbitrary. Are they or I making too much of a relatively unimportant aspect of these graphs? How is the baseline decided? Is it arbitrarily fixed? Does it, in fact, make any real difference where the wretched thing goes? Sometimes showing a baseline is important when it has a specific relevant meaning, but often it is utterly misleading to include zero. Many thanks indeed. It’s very odd that understanding seemed to dawn almost immediately after my posting. It was followed by a touch of of embarrassment.